Black and White Paper Doll PDF Black and White Outfit PDF Paper Doll Collaboration 2018Just like last year, Julie of Paper Doll School, Boots of Popculture Looking Land, and Miss Missy of Miss. Missy’s Paper Dolls and I are all creating another collaborative paper doll for 2018. Just like last year, each month there will be a different paper doll theme. Today’s paper doll base was drawn by Miss Missy of Miss. Missy’s Paper Dolls. I drew my own face and head. For the hair, I was inspired by Boots paper doll Genevieve’s hair . It’s a way of drawing hair I used to do more of and I really like how it looks for a black and white paper doll. So, I thought I would explore it for this 2018 Paper Doll Collaboration. 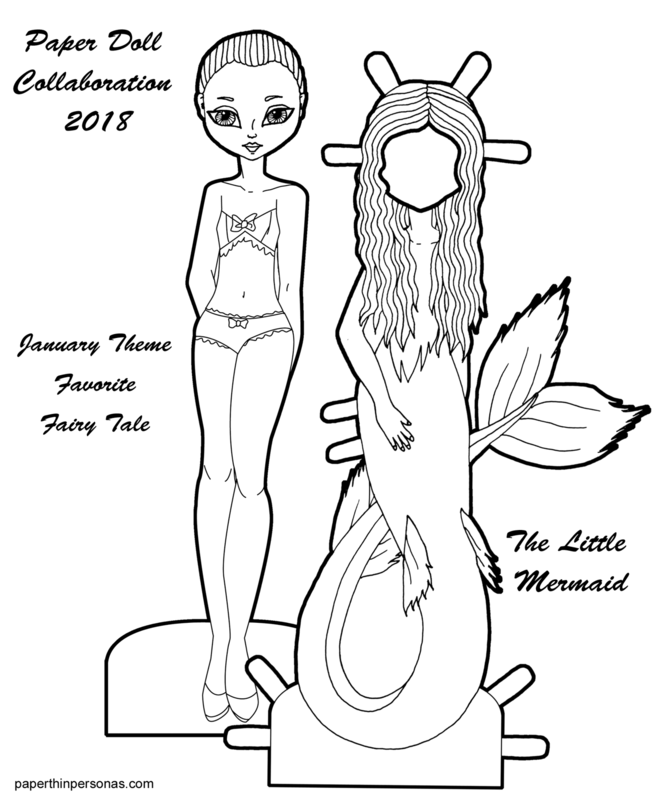 The theme for January was “Favorite Fairy Tale.” I confess that while I drew a mermaid from The Little Mermaid, it is not my favorite fairy tale. My favorite fairy tale is actually The Twelve Dancing Princesses or possibly East of the Sun, West of the Moon. And then I also adore a lot of the fairy tales written by Oscar Wilde… Anyway, picking a favorite fairy tale is clearly not easy for me. However, the moment I saw the base doll Missy had drawn, I knew I wanted to make her into a mermaid. Something about the dolls long lean shape just reminded me so much of mermaids. So, I thought the Little Mermaid was a perfect fairy tale choice. Meanwhile, go check out the other paper dolls and fairy tales from Paper Doll School and Miss. Missy’s Paper Dolls. Love the mermaid! Her hair is great. It’s nice to start this adventure again!! Beautiful! I’m so happy you’re all doing another collaboration doll! Love this!